An album of rarely recorded French and German organ music - ideal to play before or after the service, or just to hear the pieces. This is only a short album, 10 tracks lasting around 45 minutes, which is why it is has such a low price. 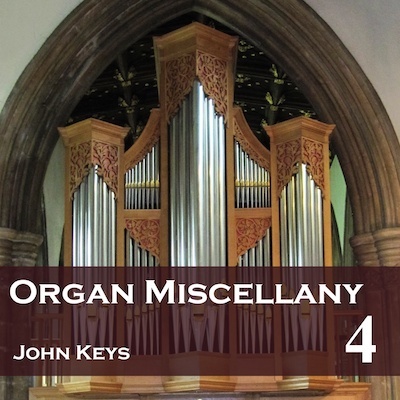 The online version is listed as Organ Miscellany Vol. 4 and has a bonus track to bring up the length. The CD can be bought online here. Alternatively, you can drop us an email at info@cul.co.uk with your order requirements and we will send back an invoice with the bank details to make a bank transfer, or send a cheque for the appropriate amount made out to Creativity Unleashed Limited to Creativity Unleashed Limited, 31 Eastbury Way, Swindon SN25 2EL, or buy using a card over the phone on 0117-230-7123 (Cheques and purchases over the phone in pounds sterling drawn on UK bank accounts only).